Victim Empowerment Program peer educator Justin Santoli discusses sexual assaults with freshmen. Students look confused as Justin Santoli walks to the front of their First Year Experience class. They immediately start asking questions, hoping their professor has cancelled class. Laying out flyers and writing on the whiteboard, Santoli explains he is a peer educator with the Victim Empowerment Program, and the topic for today’s class is sexual assault. Santoli poses a round of questions to the students to test their knowledge on sexual assault prevention. They quickly realize they don’t know all the facts. “One out of every four women has suffered from domestic violence,” he says. Young adults are especially vulnerable, with one in five women and one in 16 men being sexually assaulted while in college. Within Student Affairs, the department of Counseling and Psychological Services has a Victim Empowerment Program (VEP), which provides confidential assistance to FIU students, faculty and staff, and community members who have been victimized through threatened or actual violence. 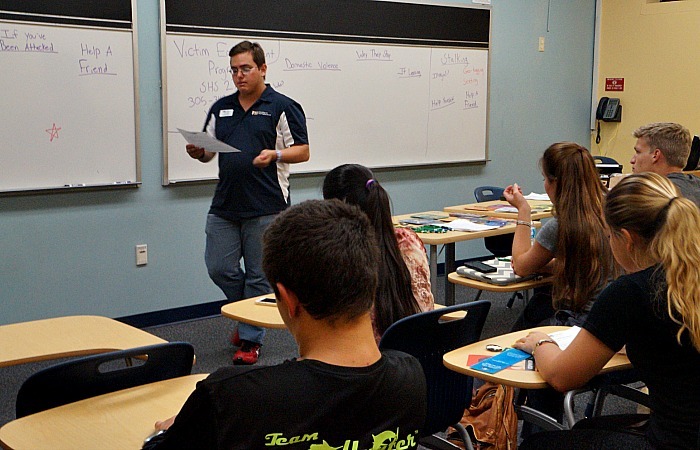 One of the many ways VEP educates students is through the peer educator program. Since 1995, VEP has had collaborative partnerships with various units around the university to host tabling events, give presentations and participate in freshman orientation sessions. In the 2014-2015 academic year, peer educators delivered 115 presentations, reaching more than 1,700 students. “Students perceive a peer presenting or talking to them as someone who is relatable or perhaps going through the same thing,” says Wendy Ordonez, coordinator of outreach and educational media for VEP. Ordonez, who was a peer educator 11 years ago, has worked with VEP since 2004 and became outreach coordinator for the center in 2007. Santoli, who has always had a passion for human rights issues, was immediately interested in the peer educator program when he saw a presentation during his own First Year Experience class. Discussing topics like consent and what it entails, what healthy relationships are and red flags to look out for when being emotionally abused sparked Santoli’s interest. “I realized I knew most of the statistics already and when I found out it was a paid job I thought, ‘this is awesome, let’s do it!’” he says. After receiving psychological education training and learning how to present material on topics like sexual assault, Santoli was required to audition for the peer educator position. He performed a mock presentation in front of VEP clinicians and advocates during which he delivered sensitive material and answered tough questions. Each year VEP hires eight to 15 peer educators. Since he took the role in Fall 2012, Santoli has presented to multiple organizations and classes, including Greek life, athletics and First year Experience classes. VEP seeks to enhance public safety and promote healthy relationships by offering prevention education, peer education and sponsoring awareness activities. VEP and FIU have also joined the It’s On Us campaign, aimed at ending sexual assault on college campuses. Since joining the national campaign in September 2014, the university has expanded education on prevention, bystander intervention and resources for victims, both men and women. If you or someone you know is experiencing relationship violence or abuse, contact the Victim Empowerment Program at vep.fiu.edu or call 305-348-2277, which serves students on both Modesto A. Maidique Campus and Biscayne Bay Campus. For immediate assistance, call the 24-hour hotline at 305-348-3000. All information shared with VEP is confidential and free of charge to the FIU community. This is an amazing program and it’s good to hear that FIU has something like this going on. Support and information makes a world of difference for victims of sexual assault. It’s an incredible initiative on the part of the Florida International University to hold a Victim Empowerment Program that intends to educate students on sexual assault. Thumbs up for this inventiveness and thanks for sharing the news.